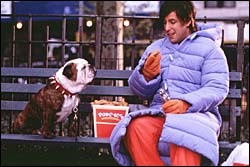 A bulldog, a bucket of chicken, and Adam Sandler hold a summit on a park bench. With "Little Nicky" (IMDb listing), Adam Sandler faces his biggest challenge. While 1999's "Big Daddy" acted as a transitional film for Sandler, making a break from his low-tech comedies in favor of sweet-tart laughs and a name-driven cast. "Little Nicky" is a bigger film for Sandler, relying on heaps of special effects and a (kinda) all-star cast. I'll freely admit that I'm a sucker for the Sandler charm. His films, although juvenile, are inventive, often uproarious creations of love. "Little Nicky" doesn't disappoint with it's macabre mixture of sinister laughs and satanic undertones (albeit very unthreatening ones). It's not Sandler's best film (I'll save that honor for "The Wedding Singer"), but it continues his unprecedented streak of comedy classics. Plus, your 10 year-old will love it. Sandler stars as Nicky, a lonely kid living in Hell who happens to be the son of Satan (Harvey Keitel). When Nicky's two brothers (Rhys Ifans and Tom "Tiny" Lister, Jr.) decide to head up to Earth to rule, Nicky's dad sends his youngest to New York City to find his siblings and bring them back to Hell. Nicky, unaccustomed to life in the Big Apple, finds help in the form of a talking dog named Beefy, who was once Satan's good friend. While looking for his family members, Nicky is introduced to the wonders of Popeye's chicken, the music of Chicago, and a young woman (Patricia Arquette) that he becomes smitten with. If "Big Daddy" went a long way to legitimizing Adam Sandler with mass audiences, "Little Nicky" feels like a return to the comic's roots. It's a wild, vulgar foray that will definitely appeal to Sandler's core audience. If you haven't seen a Sandler film, "Nicky" is not the place to start. It's much more coarse than it's predecessors, which leads to much bigger laughs, but a smaller audience for them. The beauty is that Sandler knows his audience well. With other funny films swinging wildly for unearned laughs ("Scary Movie" comes to mind), there is something admirable in Sandler's fearless comedy. There is far too much squawking about Sandler's tendency for lowball humor. It's been six films now, this is the man's sense of humor. Either you like him or you don't. I particularly love "Nicky's" sense of adventure in exploring any angle for humor. Written by longtime Sandler collaborator Tim Herlihy, "Little Nicky" features a wide assortment of devilish pranks and shockingly accomplished special effects to sell them. Because "Nicky" has a bigger budget than any previous Sandler production, there is a threat early on that the newfound slickness in the filmmaking will dwarf the easy charm I've come to expect. Luckily, "Nicky" finds a rhythm and settles down nicely. It's through Herlihy's delirious script that "Nicky" almost rises to a comic-fantasy pitch that I haven't seen in a major motion picture since Tim Burton's "Beetlejuice" back in 1988. "Nicky" is a frantic comedy that bounces to Hell and back, never once letting go of the chewy center of silliness that is so pure. Besides, how many films feature Henry Winkler attacked by killer bees? Patricia Arquette hanging over the pits of Hell by the elastic band of her underwear? The best and biggest endorsement Popeye's Chicken will ever receive in the company's life? None. Sandler is the star but "Little Nicky" is packed with familiar faces. It almost reunites the "Saturday Night Live" cast from 10 years ago with appearances by Dana Carvey, Jon Lovitz, Ellen Cleghorne, Kevin Nealon, Fred Wolf, and Rob Schneider. Harvey Keitel has a fun time as the Devil, and Patricia Arquette is thankfully held down as the love interest. The three who practically steal the film are Allen Covert, Peter Dante, and Jonathan Loughran. All the actors are veterans of "Big Daddy" and "The Waterboy," and they know (unlike Keitel) just what kind of film they're in. The trio have learned Sandler's touch, which allows them to make edgy gags work. For the climax, Sandler and director Steven Brill pull out all the stops in a viciously funny culmination that pits Nicky against his two brothers in a battle that's packed tightly with surprises and belly-laughs. Fans of "Happy Gilmore" and "The Waterboy" will be especially tickled with a couple of neat cameos. The climax of the film is rather large in scope and lends a surprising epic scale to "Nicky" that I didn't expect. It paves the way for even bigger Sandler adventures to come. If the comic doesn't bury his allure with escalating budgets and wider scopes, I will support him to the very end.